Students will compare weather data for locations at different elevations to discover the effect that elevation has on temperature. make basic predictions to how temperature changes with elevation. LIMITED ACCESS: If technology resources are limited, you can access the weather web site before your class and print the weather data or display the weather web site using a projector or television screen. GRAPHING: Students will be creating a scatter plot for this lesson. If you are new or not familiar with graphing, please review the Graphing Tips. Begin by leading a brief class discussion with the students by asking them if they can think of any cities that are located at different elevations. If students are not familiar with the terminology, it may be useful to compare a mountain and sea level as an example. After they mention several cities, ask them what they think happens to the temperature as elevation increases and decreases. Once they have discussed some responses, ask them to think of a method to prove their hypotheses. This will spark their interest in the subject and get them thinking about the relationship between temperature and elevation. Optionally, you can divide the students in pairs or small groups so they can share and discuss their predictions with each other. 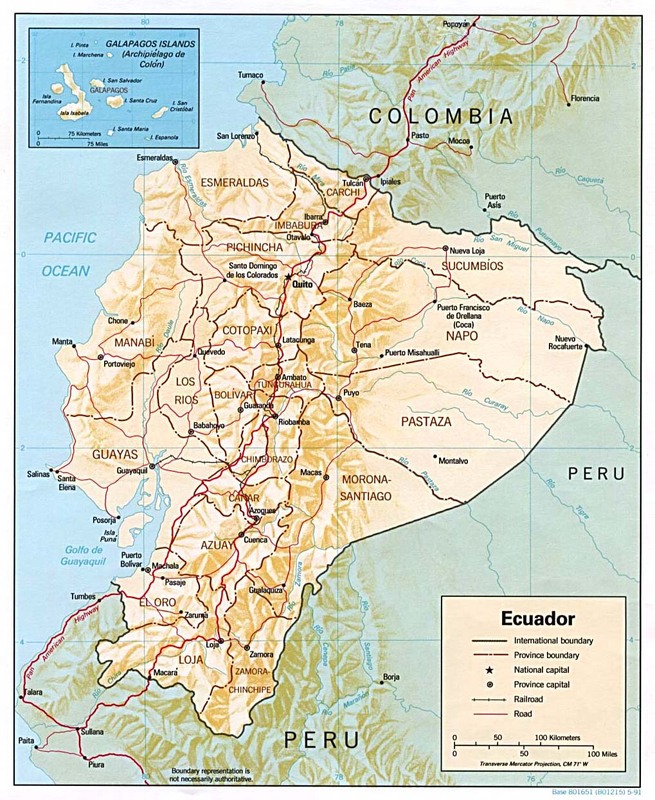 Use a wall-size map of Ecuador to show the students the locations in the table or distribute individual maps to each of the students or groups of students. You might mention that Ecuador was selected to serve as the example country to demonstrate the relationship between elevation and temperature because it has many cities with vastly different elevations all located around the same latitude and location. This is very important because students should learn that the only way to confirm the influence that elevation has on temperature is to keep all of the other variables constant. Therefore, any differences in the temperature patterns can be attributed to elevation since it is the only difference in the locations. NOTE: For the purposes of this activity, the effect that latitude will have on the temperature for each the locations is negligible because they are all within 2� of the equator. The effect that elevation has on temperature can be analyzed by using a scatter plot to graph the two measurements. Scatter plots demonstrate a trend in the data and are similar to line graphs in that they begin by plotting different data points. However, the difference is that each of the individual points are not connected together with a line but rather a trend line is added where approximately the same number of points occur below the line as above it. The students can either use a spreadsheet program (recommended) or create a graph to manually plot the points. Students should label the x-axis in meters from from 0 to 7,000m and the y-axis in Celsius from -15�C to 35�C. You may need to demonstrate how to add a linear trend line to the scatter plot if many of the students have never made one before. It is recommended that you do not use the same elevation temperature data and you should mention that a trend line will not cross every point and that they should not connect the dots but rather estimate where the line should fall so that approximately the same number of points below the line as above it. When explaining what a trend line is, it will be helpful to mention that when most of the data points are on or close to the trend line, this generally means there is a close relationship between the data points. On the other hand, if the data is all over the graph and it is difficult to draw the trend line, this most likely means that there is little correlation between the two variables. Students should be able to determine the approximate change in temperature for every increase of 1,000m in elevation based on the graph. Their answers will vary depending on the individual high temperatures for the day but should be within the range of four to seven �C for every 1,000m in elevation. The correlation coefficient corresponds to how much the different data points are correlate. For example, data points that have little or no correlation will have a correlation coefficient close to zero while data points that have a higher correlation will be closer to one. In this example, the lineal regression equation can be used to compute the approximate temperature of a particular elevation - value x. NOTE: If students used a spreadsheet program, it should be able to automatically determine both the correlation coefficient and linear regression equation. Students can either estimate the approximate temperatures at zero latitude for each of the elevations or compute the temperatures using the linear regression equation. As above, the answers will vary slightly depending on the high temperatures of the day. & 7. Students should be able to calculate the temperature estimate however in both cases their calculation will not be equal to the real values for either Mt. Everest or the Bentley Subglacial Trench. The reason for this is that they are both located at different latitudes which has a significant effect on their temperatures. The purpose for these two questions is to provide the students an opportunity to apply their knowledge from the previous activity. The students should have observed that the temperatures from the locations in Ecuador decrease as the elevation increased. Therefore, they should be able to conclude that temperature decreases as elevation increases and vice-versa. Answers may vary however the each should be similar to the following: Generally, a relationship determined by comparing data from only a few locations or from a very limited time period, such as one day in this case, is vulnerable to short-term changes and errors and therefore may be unreliable. Answers may vary but they should be more than at least two times, or double, the amount of data used for this activity. Answers may vary. Students might mention that they could collect more temperature readings from other cities in Ecuador and/or collect temperature readings over a series of days or weeks and average the data. The reason why temperature decreases as elevation increases is because air pressure similarly decreases with elevation. As the air pressure decreases, the air density also decreases causing a decrease in temperature. In other words, as air molecules become more spread out, their density decreases and the particles move slower because they are packed into a larger space. Conversely, as air pressure and density increase, temperature increases as well because the more particles move faster when packed into a smaller space, thereby making it hotter. Access the following links for each of the cities and record the high temperature for today's forecast. The first location has already been completed. Create a scatter plot of Temperature vs. Elevation using the data you collection above. Label the horizontal, or x-axis in meters from from 0 to 7,000m and the vertical, or y-axis in �C from -15�C to 35�C. Add a linear trend line (line of best fit) through the data in the scatter plot. If you are using a spreadsheet program, this can be done automatically. NOTE: A trend line will not cross every point but rather there should be approximately the same number of points below the line as above it. How do your conclusions compare with your hypothesis that you wrote in your How and Why statements from Activity C1: Factors that influence Temperature?